Details of privately developed plans to build a four runway airport on the Hoo peninsula have been formally unveiled. The ambitious plans link freight connections between sea ports to the passenger airport, built on a tidal energy barrage and flood protection barrier. A multi-runway airport capable of handling 150 million passengers a year is the central plank of ambitious plans for a £50 billion transport hub in the Thames Estuary. 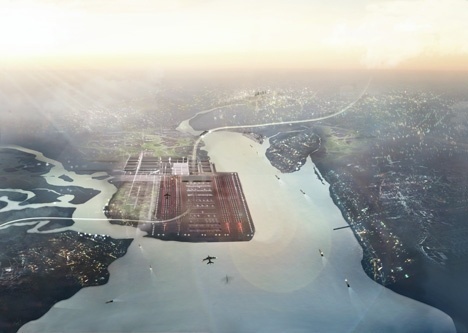 The Thames Hub plans have been outlined by architect Lord Foster, who was responsible for designing Hong Kong’s island airport. The plans call for a four-track, high-speed passenger and freight orbital rail route around London, which links to a future high-speed rail line to the Midlands and the North, the Thames Estuary ports, High Speed 1 from the Channel Tunnel to London and European networks. The four-runway airport has been put forward as an alterative to London mayor Boris Johnson’s vision for an island airport in the Thames and would be located on the Isle of Grain in Kent. Lord Foster, describing his plan as an “integrated vision for Britain,” said: “If we are to establish a modern transport and energy infrastructure in Britain for this century and beyond, we need to recapture the foresight and political courage of our 19th century forebears and draw on our traditions of engineering, design and landscape. Lord Foster, chairman and founder of Foster + Partners, believes the Thames Hub “will lay the foundations for the future prosperity of Britain”. The estuary airport is designed to be integrated within a “logistics matrix” that connects by rail the Thames Estuary ports with the ports of Liverpool, Southampton and Felixstowe. A major renewable energy source in the Estuary is associated with the hub together with a new Thames barrier crossing extending flood protection to London and the Thames Gateway into the 22nd century. The barrier would harness tidal power to generate carbon-free energy. The following link will help you voice your opinion. This entry was posted in Blog and tagged Airport, Cliffe Airport. Bookmark the permalink. Following Lord Foster’s announcement today (set for release at 6.00 am on 2 November 2011) on his proposals to build an airport on the Isle of Grain, Medway Council has today stated that this is one of the worst places for anyone to build a new airport. Not only is it on the wrong side of London, with the capital in the way for most UK air travelers, but also plans released by the architect appear to place it on top of Europe’s largest Liquefied Natural Gas containers, where 20 per cent of Britain’s gas supplies are delivered by super tanker annually. In addition, the site would also be where a major UK power station is based. Leader of Medway Council, in Kent, Cllr Rodney Chambers, said: “The plan to build an airport on the Isle of Grain is, quite possibly, the daftest in a long list of pie in the sky schemes that have been put forward for an airport. “The Isle of Grain is home to one of the world’s largest Liquefied Natural Gas terminals, with a fifth of the UK’s gas supply offloaded by container ships and stored there. It is plainly obvious that aircraft and huge gas containers are a potentially lethal mix. “In addition to this, the sunken American warship the SS Richard Montgomery is submerged just a few miles from the location and laden with high explosives, the London Array wind farm is being built nearby and the airport cuts through an area that is home to hundreds of thousands of migrating birds. “We have looked at Lord Foster’s plan and he appears to want to place his fantasy Isle of Grain airport on top of the LNG plant and a power station. It beggars belief. Cllr Chambers added: “A huge new airport on or near the Thames Estuary is both unaffordable and unnecessary and the government and many airline industry giants have already said they do not support such a plan. “In addition, a poll by ICM for Medway Council recently showed that 76 per cent of people across the country, and even 67 per cent of Londoners, are against a Thames estuary airport. “Instead, we should look to using up capacity at existing airports, which is already government policy. …..In response to the hon. Members for Central Ayrshire and for Blackley and Broughton on the issue of the Thames estuary airport, as the Prime Minister has said, the Government have no plans to build a new airport in the estuary, or in Medway or elsewhere in Kent. The hon. Member for Central Ayrshire outlined some of the practical issues that would have to be surmounted before such a programme should go ahead, including, of course, the very significant airspace capacity issues. Nor do we have plans to redevelop Northolt as a third runway for Heathrow. Crossrail and Thameslink are going ahead—both will improve access. We continue to consider other options for western access to Heathrow, including work that could be co-ordinated with the proposed HS2 spur to Heathrow. We have made it clear that a key plank of the Government’s approach to aviation is the cancellation of Labour’s misguided plans for a third runway at Heathrow. I find it ironic that the shadow Secretary of State, the hon. Member for Garston and Halewood (Maria Eagle), accuses us of having no policy, when the previous Government spent 13 years on an aviation White Paper that everyone agrees is no longer fit for purpose, and on pursuing a runway that is universally agreed to be absolutely the wrong approach for the UK economy. One of the coalition Government’s first acts was to cancel the third runway at Heathrow. I continue to believe that the price in terms of the environmental impact would have been far too high, given that noise already has a significant impact for thousands of people living with a plane overhead every 90 seconds. At the time, Labour described our position as………. I declare a NIMBY interest Norman Foster’s estuary airport plan but it could have disastrous results beyond the SS Richard Montgomery exploding (Airport Noise, letters Nov 3). An infrequently mentioned but major reason for Alistair Darling (as the then Transport Secretary) rejecting an airport on the same site 8 years ago was that “even with world-class management” it would pose a greater risk of disaster through bird-strike than any other main UK airport. This has not changed. During this debate,apart from what has already been said, why has there been no mention of the developement at Chattenden,the new huge container port at Stanford -le- Hope ( right opposite Cliffe/ Cooling/ High Halstow) and that Eddie Stobart has bought Southend (London) Airport and is expanding it to take Jumbo Jets with a new railhead and terminal, with the extended runway directly in line with High Halstow. These things are already happening,we don’t need any more idiotic ideas to blight us! Following Lord Foster’s announcement today ,2 November 2011 on his proposals to build an airport on the Isle of Grain, Medway Council has today stated that this is one of the worst places for anyone to build a new airport.